This the 3rd of the Thank You cards that I mentioned in previous posts. I family member requested them, and I'm more than willing to make them for her. She does so much for all of us, so I would do anything I can for her. She's dealing with a lot right now, I just wish there was more I could do to help her. If you read my blog posts via email, just click HERE to go directly to my blog, to see all 3 cards. This card is going into the Cath's Tuesday Trigger - "I've a notion". Cath's blog over at Moxie Fab World is a must for any stamper. She provides SO much inspiration and shares so much info. Not to mention the interviews she shares. Well...I digress! This is the inspiration photo for the current Tuesday Trigger. 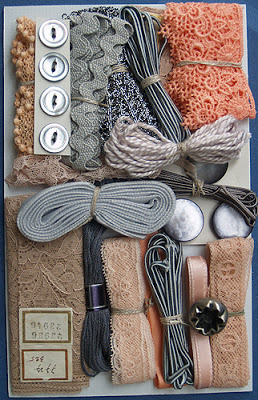 Oh my, I love vintage lace, ribbon and buttons. So this photo got my attention immediately. I HAD to find time to play along. Here's what I created. I pulled out my boxes of vintage lace and trims and used 2 of them here. The wide ecru lace and the narrow taupe/cocoa trim. The other 2 (the gray velvet & the sand colored fancy edge ribbon) are from Stampin' Up!...a discontinued ribbon pack called Beachfront. I used a border punch on the card front, then backed it with some gray cs. I even sorted through my vintage buttons to find this cute little silver button. I threaded a piece of SU's 1/8" vanilla taffeta ribbon through the button holes, then tied it in a bow. Thanks for taking the time to stop by. I hope you'll leave a comment! Beautiful use of these gorgeous notions! Oh wow, this is beautiful! Those colors are great together and you've done a fabulous job of combining all those trims! Very pretty card and a wonderful take on the Trigger! I love the colors and layers of notions you used. The sentiment is a lovely addition. Those vintage ribbons are so beautiful & so perfect for this trigger. So sweet! Love the layers!